On the 20th of July I went over to The Black Country Museum 1940s event in Dudley, just south of Birmingham. The Black Country Museum has numerous town buildings from the past, including an ironmongers, car showroom and even a fairground. This makes it an ideal setting for 1940s events, as people can get a real sense of what it was like to live in a small town during the war. The Mamiya C330F was the only choice for this event, and even though I had some good results from the Brownie at Crich, I chose not to use it at this event. Film choice was relatively easy, as it was sunny for the majority of the day. FP4 always produces good results in bright sunlight, and even more so with the 80mm f/2.8 lens. There were many people attending this event, so I was spoilt for choice as to what and who to photograph. 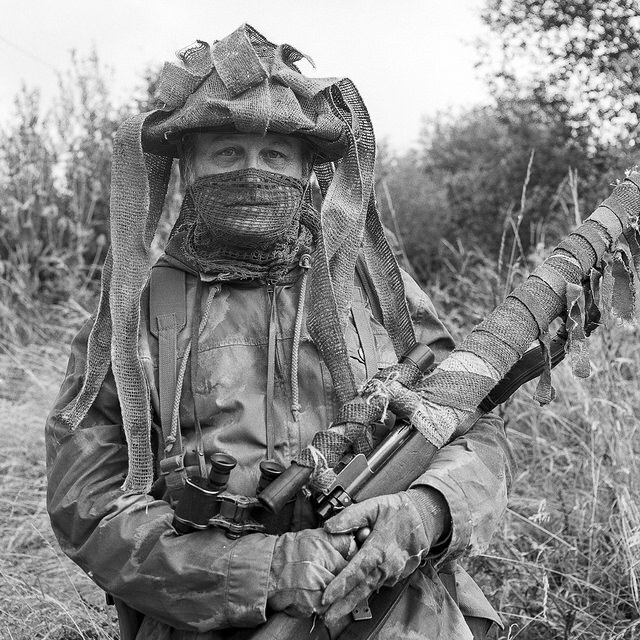 One of the first photographs I took was of a man dressed as a British sniper, complete with gillie suit and Enfield rifle. The tones and the detail in this shot have picked out all the textures from this gentleman’s clothing. The intense stare adds to the menacing feel of the photograph. The image quality and tones here worked really well, and the closely cropped shot of the Sniper gave more emphasis to the face. The background makes the photograph feel as though he’s out in the field, on active duty. Many people attend these events in sharp suits, trousers and shoes. It’s always great to see people make such an effort to dress up in the period style. One such gent was situated in the Toll House, just off the main road into the small town. 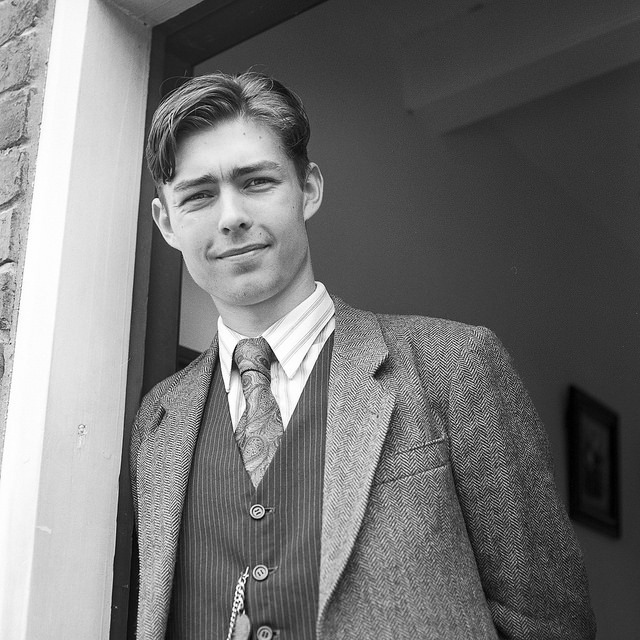 A smartly dressed Gent in the Toll House. This photograph had a real and genuine feel, mainly down to the attire featured. Such photographs almost take themselves, as they fit in with the exact look that I want from this series of images. Getting photographs that feel genuine during these events is a real challenge. During this event there were a series of mock air raids, featuring re-enactors who would put out fires, rescue people from buildings and secure the town. 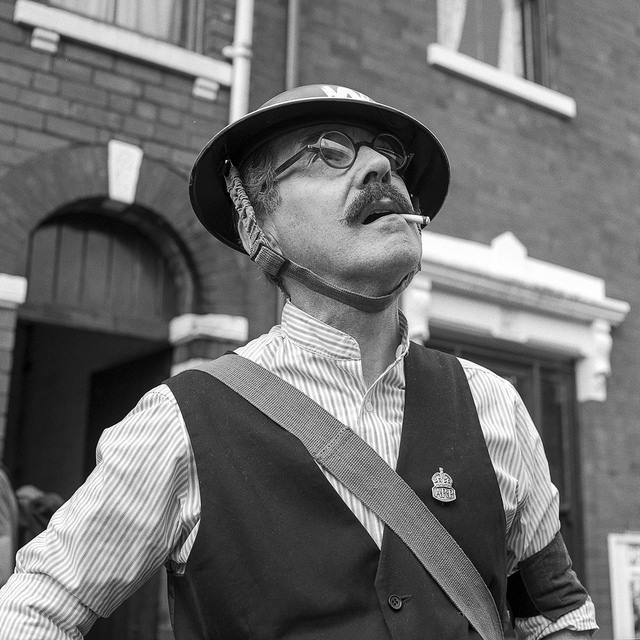 One such re-enactor was an air raid warden, who really looked the part with his hat, glasses, cigarette and mustache making for a memorable image. A re-enactor dressed as an air raid warden produced a great photograh as he looked for bombers flying overhead. The setting at the Black country Museum really makes this photograph work. The expression and pose of the re-enactor is spot on – he almost looks like a character in a film such is the emotive feel of the photograph. As part of my endeavor to photograph more ladies at these events, I have started to produce some decent results. 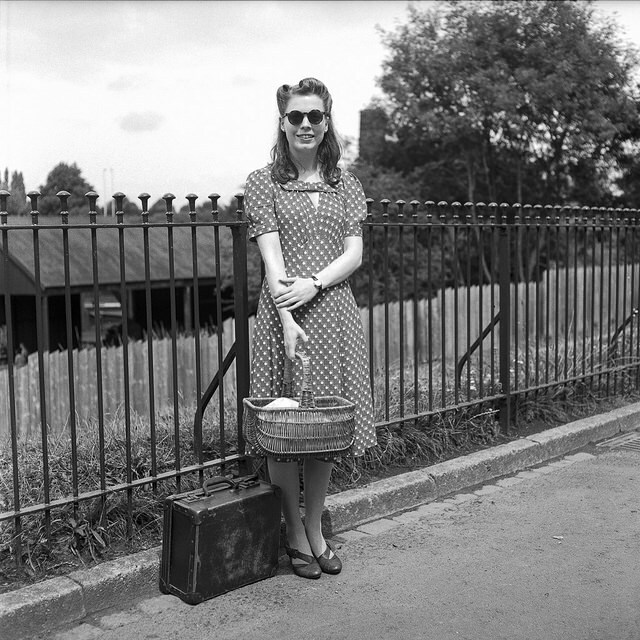 A lady in a lovely pattern dress, complete with sunglasses, victory rolls and picnic basket. A full length shot produced a classy, timeless image. I really liked the way this photograph came out, as the lady looks as though she is all set for a day trip out somewhere, and is waiting for a taxi to take her to the station. It’s narratives like this that can allow people to read deeper into the photographs and makes them come to life. 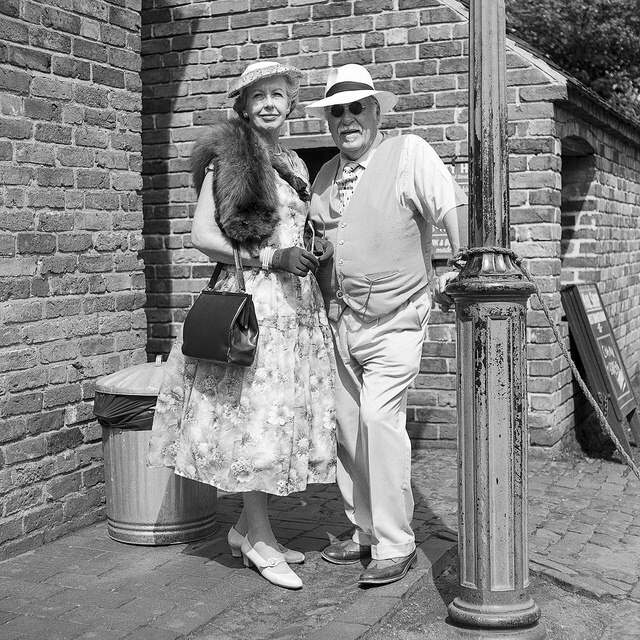 Couples dressed well together were in high supply at the Black Country Museum event, and the street setting made some ideal backdrops for photographing them. A couple by a lamppost made for a great image as they posed on the street. The square framing works much better in full length composition for couples. I have started to find that full length portraits work really well with the square format, but the added difficulty is getting a clean enough background to make the images work at these events. I think that I should get more use out of the longer 135mm and wider 55mm lens to mix up the composition of images. 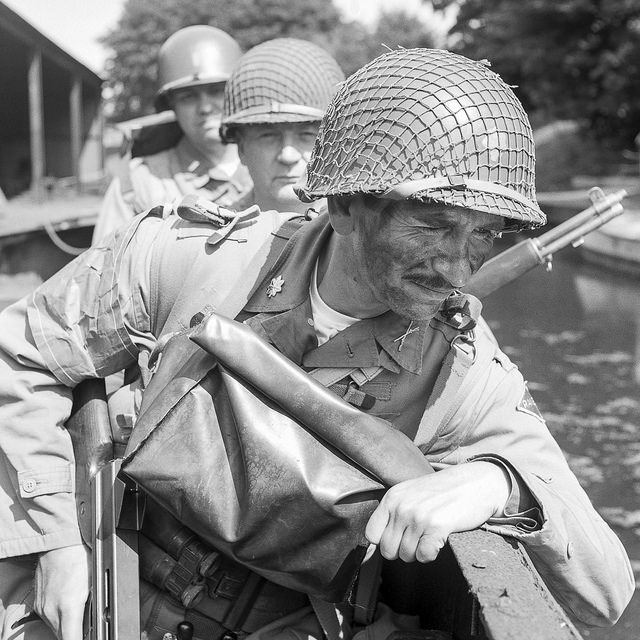 I was lucky enough to be asked by some of the re-enactors to photograph them on one of the barges in the canal, to try and replicate a scene on a landing craft. I loved the way the soldiers heads lead through the image, and the way the depth of field focused the eye onto the troop at the font of the image. I though that this photograph had a lot of depth, both in the composition and tones created by the FP4 film. The background blur and the sharp foreground details give an emphasis to the soldier stood in the foreground. I don’t often take photographs that just set the scene, mainly because there is often a mix of people dressed as re-enactors and in moderns clothes in a single image. When the composition is clear though, it often create a great photograph. 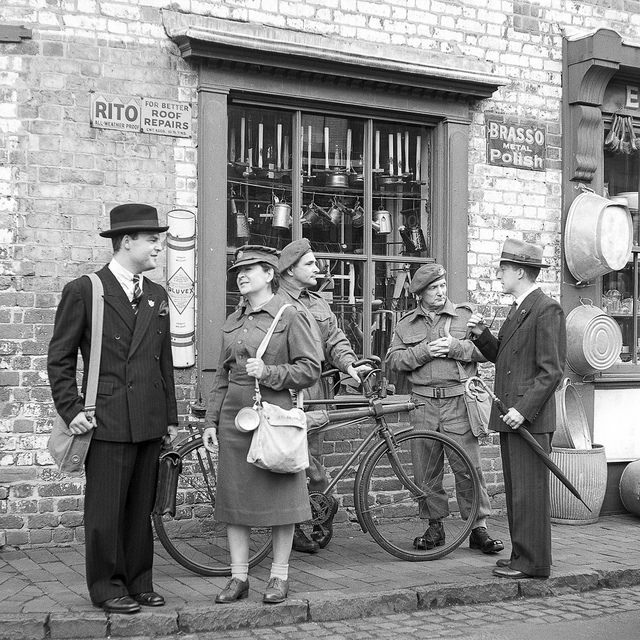 Re-enactors casually chatting outside of the ironmongers at the Black Country Museum. I felt that this image could have been taken in the 1940s, such was the timeless look of the scene. People often question me about my photographs, often mistaking them for found negatives. I feel that this image will also provoke this question when people see it, as it just looks so of it’s time. For me, trying to recreate this idea at these events is the pinnacle of what I am trying to achieve with this project. I had a great time at the Black Country Museum 1940s weekend. It had an amazing variety of re-enactors, and a fantastic setting for them to come to life in. The town center and shops provided the ideal backdrop for the re-enactors to be in, and there was a huge amount that I didn’t really get to see, including the fairground and mining area. I have a full set of images from the museum in my Black Country Museum 1940s Weekend set on Flickr. If you are featured in any of the images and would like a print, please get in touch.